I’m optimistic about … medical mindfulness. People don’t like to wait; not for hamburgers, haircuts, or medical care. And more and more, the same assembly line practices applied to the sale of consumer goods are now being brought to bear in the delivery of healthcare—everything from the incorporation of Lean Toyota process improvement practices, to electronic medical records, to hospital billboards with LED displays of ER wait times. So it is that I found myself working in the triage area of a local hospital ER, where my job is to screen patients immediately upon their arrival. The idea is to get the wait time to see a healthcare provider down to just a few minutes. In practice, the majority of patients walking into an ER don’t have emergencies. Most complaints are routine, requiring few resources and little diagnostic acumen. People come to us with acute, non-emergent problems or exacerbations of chronic ones for a host of reasons: convenience, a quick-fix, reassurance, tests that aren’t available through their doctor’s office, or, more often than not, because we’re their only option for care. And that’s okay. One of the things that attracted me to the field was knowing that my specialty is the only one willing to see anybody for anything at any time. As it turns out, about half of all ER patients can be seen briefly in the triage area and discharged with minimal or no testing. Of those requiring something more, the majority can be evaluated in a minor care area by a nurse practitioner or physician assistant, leaving only those arriving by ambulance and the sickest of the walk-ins for the main treatment area. Putting a physician in the triage area along-side a nurse certainly expedites the process, but I have to question a system that allocates equal personnel to seeing toothaches, colds, and chronic back pain as is devoted to caring for strokes, heart attacks, and sepsis. The goal of emergency medicine is not to see how many non-emergent cases I can cram through the system, but rather to see those with life-and-limb threatening emergencies quickly, compassionately, and competently. To use an analogy, working in triage as a residency trained, board-certified, emergency physician is like being a classically trained chef stuck behind the grill at McDonald’s. There’s a lot of ground chuck, and not much filet. During a recent triage shift, I evaluated a 43-year-old man with asthma. He’d been to our ER a week earlier and had received inhalation treatments and steroids for wheezing. I quickly reviewed the chart; nothing seemed amiss. He’d been discharged with prescriptions for an inhaler and a course of outpatient steroids in addition to referrals for follow up. Routine treatment for a routine problem. No labs. No x-rays. Unfortunately, he had never purchased the prescriptions and hadn’t followed up with the clinic, so of course he wasn’t better! His presentation was entirely typical for the sort of folks I see all day when working in triage: self-destructive, non-compliant, and seemingly possessed with an endless capacity for bad lifestyle choices. The patient reported that he wasn’t getting better. In fact, he was worse. Just walking up a flight of stairs was difficult. He was short of breath all the time and had a cough (most ER asthma patients do), but no fever and no bloody sputum. Although he appeared anxious, his vital signs weren’t bad; no fever, normal blood pressure and oximeter reading—the last a marker for how well his lungs were oxygenating his blood. His pulse was elevated but still less than 100/min. He was pulling to breathe, the neck muscles atop his T-shirt straining to assist the diaphragm in doing its work. I took a quick listen. There were wheezes coming from the bases of both lungs. His heart sounds were normal. I felt his legs; no swelling, no tenderness. I let the nurse finish the litany of mandated triage questions (all 48 of them) before adding a few of my own. Then I placed some orders in the computer: a breathing treatment, chest x-ray, oral steroids, and a D-dimer blood test. My role in his care was now finished. He was too sick to discharge from triage, but seemingly not sick enough for the main treatment area. I sent him to minor care to be looked after by one of our physician assistants. The only thing out of the ordinary in the tests that I ordered was a D-dimer blood test, a sensitive but non-specific screening tool for clots, meaning that it has few false negatives (wherein the test is negative but the patient actually has a clot), but lots of false positives (wherein the test result is elevated but the patient doesn’t actually have a clot—or at least not one in the lung). There is an inverse relationship between sensitivity and specificity. Pick a low cutoff for what constitutes “normal,” and the test will miss very few people with the disease but at the expense of working up lots of folks who don’t have it. In this case, I ordered the D-dimer to screen for a pulmonary embolus, a potentially life-threatening problem wherein a clot formed elsewhere in the body dislodges and then travels downstream through the heart before lodging in the lung. Moderate to large clots limit both the lung’s ability to take up oxygen and off-load carbon dioxide, and the heart’s ability to pump blood. Massive clots completely occluding the pulmonary artery are rapidly fatal. Chest x-rays may contain clues that a patient has an embolus, but to confirm the diagnosis requires a CT angiogram of the chest. The problem with using the D-dimer test to determine whether or not to order the scan lies in the fact that there are a lot of false positives associated with the screening test, meaning that a lot of people without the disease will wind up getting an expensive test and being exposed to a lot of radiation. There’s also the problem of overdiagnosis, wherein the CT angiogram detects tiny clots never destined to cause harm leaving the physician in a therapeutic quandary. Treatment of a clot requires placing the patient on a blood thinner for at least 6 months to a year. Drugs like Coumadin, Eliquis, and Xarelto are associated with all sorts of bleeding complications. Given our current medicolegal climate, however, it’s a sure bet that anybody diagnosed with a clot, no matter how small, will be placed on one of these drugs. What’s not clear is whether this strategy helps more people than it harms. As it turns out, one of the physiologic functions of the lung is to filter out very small clots that invariably form in everybody, thereby preventing them from gaining access to the brain where they can cause a stroke. Because of the complexities in diagnosing the disease and the seriousness of both not treating and treating it, the evaluation of patients with a suspected lung clot has garnered more research than just about anything else I can think of. Protocols have been developed to help guide physicians through the process, but none of them are perfect. Certain risk factors place patients at higher risk for clotting: a history of cancer, trauma to a limb, immobility (a long plane, train or bus trip), or recent surgery, among others. In fact, post-op clots after leg surgery are so common that it is now standard procedure to employ limb compression devices and blood thinners to prevent them. In the ER, any patient with a unilaterally swollen leg is presumed to have a deep vein clot (DVT) until proven otherwise. Some people are genetically predisposed to forming clots. 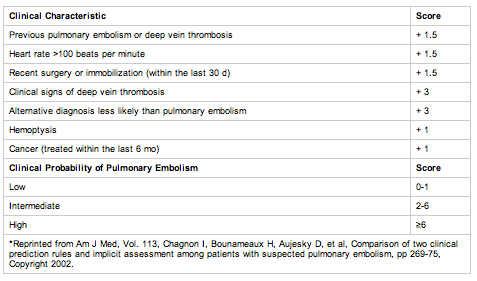 Not surprisingly, the biggest risk factor for a pulmonary embolus is having an existing clot in the leg. But my patient had none of the standard risk factors. In fact, his Wells Score was zero and current guidelines recommend against ordering a D-dimer in such patients. I wasn’t particularly shocked, however, when the result came back nearly 20-times normal. I was more surprised when the subsequent CT angiogram revealed a massive clot sitting in his pulmonary artery at the point where the vessel splits into the right and left lung, something known as a “saddle embolus” for its representative shape. Add just a bit more clot to this kind of embolus and the patient dies, as likely would have been the case for him in the near future had the clot gone undiagnosed. The physician assistant, a bright, experienced, energetic woman but one relatively new to the field of emergency medicine, asked me how I knew to order the test. I replied, “Sometimes it’s better to be lucky than good,” but that wasn’t quite true. I was lucky, but I was also good. In this case, very good. If I had simply focused on his wheezing, I would have missed the diagnosis entirely. Merriam-Webster defines gestalt as “a structure, configuration, or pattern of physical, biological, or psychological phenomena so integrated as to constitute a functional unit with properties not derivable by summation of its parts.” That’s a mouthful, but what it really means is listening to your inner voice when the pieces don’t fit. Emergency physicians are experts at pattern recognition. We employ Ockham’s razor in believing that the simplest explanation is the correct one. Over time, the use of mental shortcuts (heuristics) becomes automatic, allowing physicians to very rapidly come up with the most probable explanation for a patient’s condition. When something looks, acts, and smells like a duck, we call it a duck. And we’re always right—except when we aren’t. The problem with employing mental shortcuts is that they require assumptions, and the conclusions derived can never be better than the biases that went into making them. The most common diagnostic error involves the process of anchoring, wherein the physician fixates on certain features of the case resulting in the tendency to consider only a single diagnosis. Anchoring is the leading cause of failure to diagnose, and failure to diagnose is the leading cause of lawsuits. “Your first impression is the right one,” is an example of an anchoring reinforcement. This type of bias also typically allows other biases to creep into the picture. Confirmation bias occurs when doctors order only tests that are likely to confirm the initial impression, while failing to consider tests that might lead to an alternative diagnosis. In what amounts to a downward spiral of failed heuristics, anchoring and confirmation bias lead, in turn, to premature closure, wherein all alternative diagnoses and treatments are rejected. On average, there are nearly 6 sources of error involved for each missed diagnosis resulting in patient harm. The concept of availability, in which the diagnosis rendered is the one that most readily comes to mind, is a frequent source of misdiagnosis. Whereas a cardiologist is more likely to consider a heart rhythm disturbance as the cause of a patient’s fainting, a neurologist will likely focus on the possibility of a stroke. Both will be wrong if the real cause is low blood pressure from sepsis. The availability of a diagnosis depends upon the prevalence of the disease within a given physician’s patient population. Just as I would not expect my Arizona colleagues to instantly recognize the rash of Lyme disease, I would be lost in recognizing the telltale signs of a scorpion envenomation. Another source of error has to do with posterior probability, wherein a patient is assumed to have what he has always had in the past. An alcoholic with chronic pancreatitis who presents with abdominal pain after a night of drinking will automatically be assumed to have recurrent pancreatitis. A physician seeing this patient might decide to play the odds and defer the usual abdominal pain work up, thereby causing him to miss the diagnosis of a perforated ulcer. In the case of my patient, I could easily have written off his complaint as just another asthma attack. Counter-transference is a type of bias in which the physician develops personal feelings regarding the patient, which may be either positive or negative, leading to a loss of objectivity. The drug addict with maggots crawling from an infected injection site might be given the short shrift, whereas the same physician might take extra time talking to a young woman who reminds him of his daughter, missing the diagnosis of an STD as the cause of her lower abdominal pain. “Drunks will burn you” is a long-standing ER maxim, but few doctors recognize that the truth behind the platitude is primarily due to our own feelings of negative counter-transference. And then there are the more obvious biases of homophobia, antisemitism, sexism, ageism, and racism. All told, one form of bias or another creeps into almost every patient encounter, and, with so many ways to get it wrong, it’s no small feat that we so often get it right. I’ll admit that I was annoyed when my patient confessed that he hadn’t gotten his prescriptions filled while continuing to buy cigarettes, but I didn’t succumb to cynicism (at least not this time). Forced to confront my own biases, the patient “looked” too sick for a simple asthma attack. My concern for a pulmonary embolus was based on experience and gestalt. It’s said that good judgement comes from experience, and experience comes from bad judgement. Making the diagnosis required listening to my inner voice, the one that said, “The pieces here don’t fit.” It was in knowing that an unusual presentation of a common disease is far more likely than the common presentation of an unusual one. It was about mindfulness, defined as paying attention to the ordinary, the obvious, and the present. In a world full of metrics, mandated interruptions, and pay-for-performance, a place where Press-Ganey scores matter more than competency, and door-to-physician times mean more than compassion, mindfulness is still the most important attribute a physician can possess to serve the public. If practicing it causes me to be a bit slower than some of my colleagues, I can live with that. And so can my patients. But, can the administrators? Philip Wells et al., “Use of a Clinical Model for Safe Management of Patients with Suspected Pulmonary Embolism,” Ann Int Med 1998; 129 (12): 997-1000. Paul Stein et al., “Diagnostic Pathways in Acute Pulmonary Embolism: Recommendations of the PIOPED II Investigators,” Radiol 2007; 242 (1): 15-21. Kline et al., “Clinical Criteria to Prevent Unnecessary Diagnostic Testing in Emergency Department Patients with Suspected Pulmonary Embolism,” J Thromb & Haemost 2004; 2 (8): 1247-55. Jadranka Stojanovska et al., “CT Pulmonary Angiography: Using Decision Rules in the Emergency Department,” J Am Coll Radiol 2015; 12 (10): 1023-29. Arjun Venkatesh et al., “Evaluation of Pulmonary Embolism in the Emergency Department and Consistency with a National Quality Measure: Quantifying the Opportunity for Improvement,” Arch Int Med 2012; 172 (13): 1028-32. Stephen Wolf et al., “Assessment of the Pulmonary Embolism Rule-Out Criteria Rule for Evaluation of Suspected Pulmonary Embolism in the Emergency Department,” Am J Em Med 2008; 26 (2): 181-5. Nadine Gibson et al., “The Importance of Clinical Probability in Interpreting a Normal D-Dimer in Patients with Suspected Pulmonary Embolism,” Chest 2008; 134 (4): 789-93. Pat Croskerry,” The Importance of Cognitive Errors in Diagnosis and Strategies to Minimize Them,” Acad Med 2003; 78: 775-80. Mark Graber et al., “Diagnostic Error in Internal Medicine,” Arch Int Med 2005; 165: 1493-99. Pat Croskerry, “Achieving Quality in Clinical Decision Making: Cognitive Strategies and Detection of Bias,” Acad Em Med 2002; 9 (11): 1184-1204. This entry was posted in Uncategorized and tagged medical error, medical mindfulness, pulmonary embolus. Bookmark the permalink.